Last week I posted about Jan and I having a great time exploring the sites in downtown Chicago after the Chain Link conference. 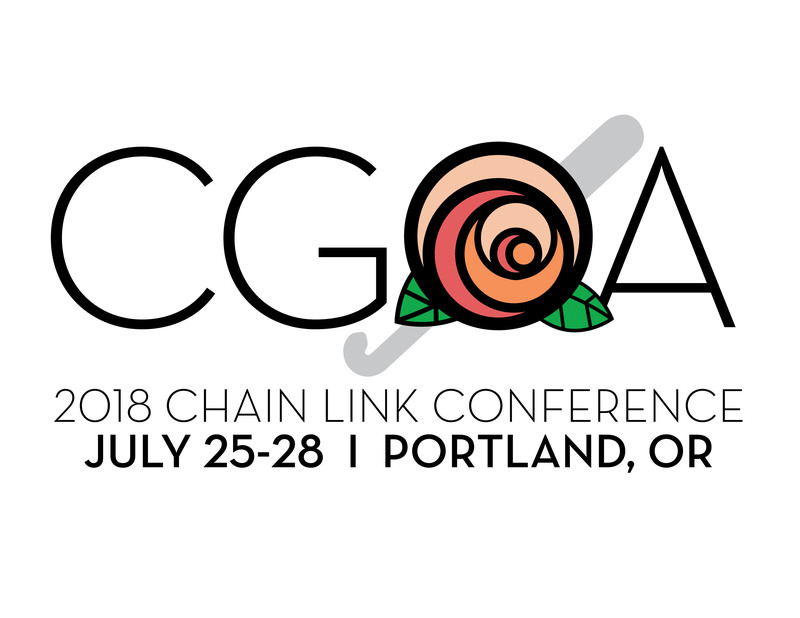 Today I’m writing about the 2018 Chain Link Conference in Portland, Oregon. For me this is going to be a bit of a home-coming. The first CGOA show I went to was in Portland in September 2008. I’ve told the story before how I met some of my dearest friends at that conference, two of them being Jan and Pam. In fact I met them both in my first class there. Who could have guessed that a little less than 10 years later I would be returning to Portland for a conference as a board member? It will be a very busy conference for me as I hope to meet as many of our membership as possible, while also attending to my board responsibilities. One of the exciting events at each conference is the Design Competition. The chair person this year for that committee is Louise Thurman and I am the board advisor. She and I have been working to get everything in place for the competition and I’m excited to see it coming together. If you haven’t ever entered a piece in the Design Competition then this could be your year, you just need to be a member of CGOA to enter. The deadline for entries is June 30th, so you have plenty of time to get something ready. If you’ve been one to experiment with crocheting you may already have a finished piece that can be entered. It doesn’t have to be recently crocheted, it just needs to be your original design and not publicized or published before. Fashion: garments (not accessories), including sweaters, tops, jackets, vests, skirts and dresses. Accessories: including wraps, scarves, cowls, socks, mittens, hats, bags, belts and jewelry. Home Décor & Afghans: items primarily for the home, including afghans, throws, and baby blankets. Tunisian: 80% of design needs to be Tunisian crochet. Artistic Expression: items more artistic in nature, including free-form or mixed media pieces, wall hangings, and wearable art. Thread Crochet: anything made in crochet thread or fine/lace weight yarn (CYC category #0/Lace); this category may overlap other categories, and includes doilies, garments, baby clothes, or accessories. Then there will also be the $1000 Grand Prize, the Technical Merit Award, and the People’s Choice Award. Judging will take place at the conference Wednesday and the winners will be announced Friday evening at the Awards Ceremony. All the entries will be on display Thursday evening thru Saturday afternoon at the marketplace. Folks attending the conference will be able to cast a ballot for the People’s Choice Award, which will be announced Saturday evening at the Closing Ceremonies Banquet. You can find out more details about the Design Competition and how to enter it at the CGOA website: Crochet.org. From the home page use the Members Only drop down menu at the top, then go to Design Competition.